If you’re already thinking about your next adventures for 2016 then perhaps a motorhome holiday could be part of it? Have you often thought about travelling the world with that little bit of extra freedom? A motorhome holiday could provide exactly that. For travel and holiday inspiration you might want to think about joining us at the Caravan, Camping and Motorhome Show. This takes place this year at the NEC and runs from 23rd – 28th of February. Travelling via motorhome offers you the opportunity to travel through glorious scenery, park up next to known beauty spots. Enabling you to be at one with nature and travel on your own time! If you’re a lover of the outdoors, or feel like you don’t see enough then a motorhome holiday is perfect. It’s a chance to get the whole family together! So that you can take to those destinations you’ve always wanted to see. You might not have the money or the justification to buy a motorhome outright, which is where a motorhome holiday can fill the gap. Alternatively, if you’re visiting the show because you are already tempted with the idea of buying a motorhome. 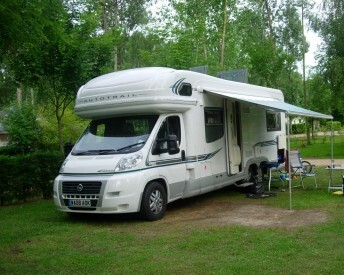 A motorhome holiday allows you to try before you make the leap and buy. At the show, you can talk to us directly about our packages, destinations, tours and services in more detail and we can even help you plan and organise a bespoke trip, or even help you plan a holiday with your own caravan or motorhome as part of our Motorhome Travel Service. We’ll also be running a competition at the show where you could win a ‘free 7-day holiday’ for up to four people, so come and see us and ask about how you can enter. The winner will be selected on Sunday 28th February 2016. With over 350 exhibitors, the Caravan, Camping and Motorhome event aims to give you holiday inspiration for all types of caravan and motorhome holidays and should give you a good idea about the flexibility of a leisure vehicle. You will also find hundreds of caravans, motorhomes, tents, folding caravans, caravan holiday homes and lodges and lots of accessories. There’s plenty to keep you entertained with features including: a free towing experience or motorhome manoeuvring lesson, cookery demonstrations, a glamping village, the Guiness Book of Records world breaking lego caravan, the opportunity to have a look inside all of the latest models and loads of accessories. For six days, the Caravan, Camping and Motorhome Show runs from 10am-6pm and adult ticket prices are a very affordable £8, with senior tickets £7 and under 15s go free. If you want to hear more about us and our motorhome holidays then speak to us at the show, or call 0117 9372644, alternatively you can email: info@motorhometravelagency.com.